Let’s face it – we’ve had historic rains in parts of Ohio during 2018 and we are now observing many late season issues that come with this. Seed quality is one of them and the symptoms or warning signs that there could be issues are on the stems. The stems in some fields are heavily colonized with a mix of disease pathogens that cause Anthracnose, Cercospora, and pod and stem blight (Figure 1). The bottom line is that all of these diseases can be better managed with higher levels of resistance but ultimately during 2018 – we had a perfect storm, lower levels of resistance combined with higher than normal rainfall conditions and add in the presence of a new insect pest, stink bugs. Below I’ve outlined the general conditions of the crop and for each disease, the distinguishing characteristics. 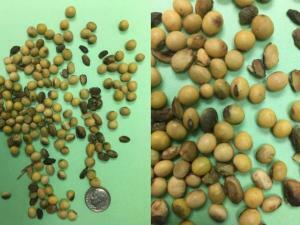 Discolored, moldy seeds along with shriveled seeds are very evident in some fields (Figure 2). Some reports indicate that it is worse around the edges but not in all cases. Sometimes the pods look fine until they are cracked open and others the outside of the pod is a definite give away. Fungi in the genus Cercospora can cause two different diseases, frogeye leaf spot which also affects and stems and seed is caused by Cercospora sojina; and purple seed stain is caused by a complex of species, the most common has been C. kikuchii. The symptoms of frogeye leaf spot during the season were well documented this year, but on stems and pods they are not well described. In our experience, the gray to black smudges on seed and yield the conidia of this pathogen. For C. kikuchii, the first symptoms can appear on the petioles during the reproductive phases. These appear as purplish to reddish streaks which turn darker after leaflets drop but the petioles can remain on the stems. On seed, dark reddish purple blotches will appear. Diaporthe pod and stem blight including Phomopsis were very apparent this year. Some of the stems I collected this season were just pure fruiting structures. 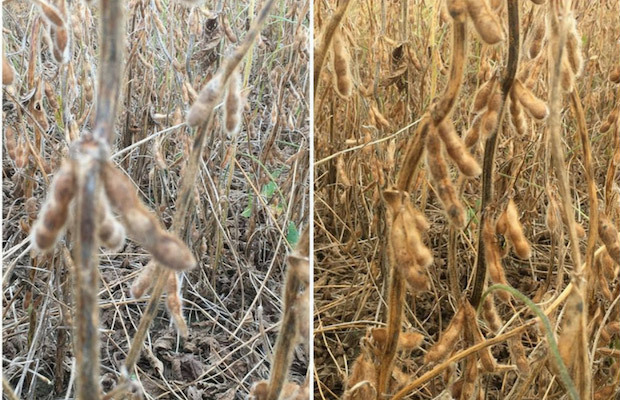 This is a complex disease, in that there are several closely related fungi that can infect soybeans throughout the growing season. These sometimes appear as black dots in a row on the stem, but some species are more randomly placed over the surface of the stem or pods (Figure 3). They are flask like structures that hold the overwintering spores. We have documented several different species causing substantial losses in Ohio over the past 3 years. Anthracnose – this has been very rare in Ohio but this year I did find it on petioles early on some susceptible varieties. This is another one that looks like a black dot, but this fungus, Colletotrichum truncatumand related fungi have hairs (setae) that are around the fruiting structures. A moist chamber and a microscope can help sort out the differences. Pods can have lesions that are large brown and irregularly shaped. 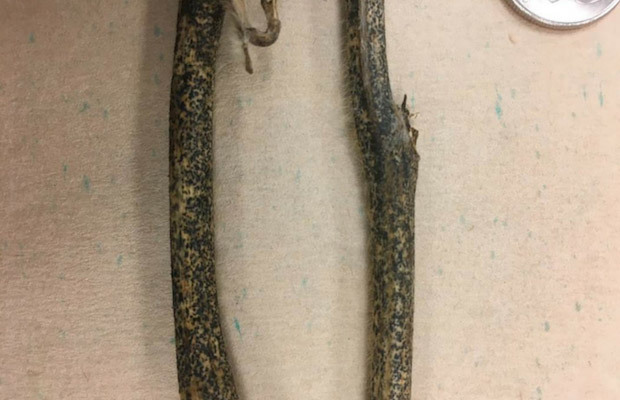 Opportunists – based on some plating we have done over the past week, there are many secondary fungi that have been able to colonize these seeds. It will take us a few weeks to identify everything to verify that are opportunists and not pathogens, but let’s just say it is pretty ugly even for a mycologist. 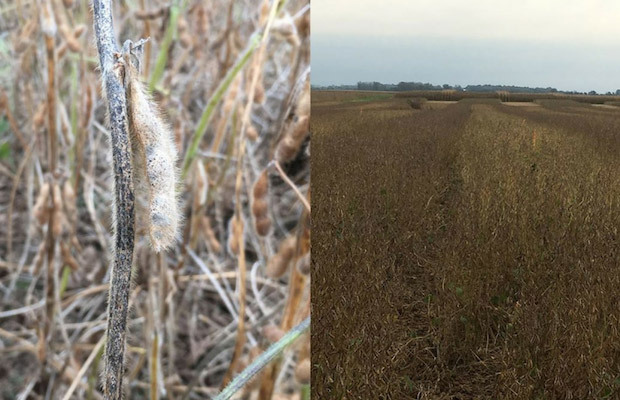 Don’t plant the same variety back in the same field – Rotate varieties and look for those with better resistance scores than your current one. Do something to help break down the residue, it doesn’t need to be a lot, but some light tillage to bury some of the residue will go a long way. Rotate to wheat, barley, or corn. These are non-hosts for this group of pathogens and planting something else in that field will go a long way to reducing inoculum for when soybeans are put back in that field. Photos courtesy of Ohio State University and the United Soybean Board.